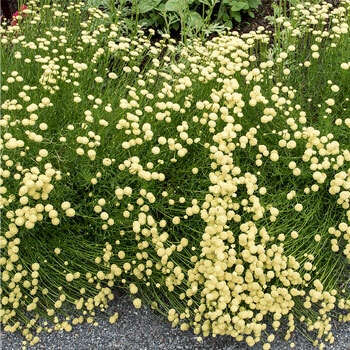 A compact shrub of bright green, aromatic foliage and slender stems, topped with creamy white to light-bright yellow button flowers. Perfect for well-drained sites that are hot and sunny. Depth: Just cover; sprinkle lightly with fine vermiculite or straw to retain moisture and prevent washing out. Requires light. Starting Indoors: Sow in pots 8 weeks before planting out. Keep at 68°F and provide light. Good for low-maintenance areas and rock gardens, but will also do well in average garden beds. Prefers poor to regular soil that is well-drained in full sun. Also great for edging, especially in coastal cottage gardens, and useful as a low screen, such as along a chicken coop or fence. Watering Details: Water during especially dry spells. Allow soil to become dry on top between waterings. Fertilizer: No need to fertilize. Plant: Aromatic bright evergreen bushy plants, with a somewhat musky fragrance. Lavender cotton is a member of the daisy family, Asteraceae.